Vancouver Island Cemeteries and Masonic Interments – Temple Lodge, No.33, Duncan, B.C. As part of our Vancouver Island Masonic History Project we are gradually compiling records of Freemasons interred in Vancouver Island cemeteries. For Freemasons who were cremated or are not interred on Vancouver Island, see our Deceased Brethren page on our older web page design. Please note that we are updating the appearance of our website and are gradually converting our old web pages to the new format. While these updates are going on, our old page on Vancouver Island Cemeteries is still online here. Here is a partial listing of Vancouver Island Cemeteries which contain the graves of deceased Brethren. Please note that list is currently not complete and we will be adding more cemeteries and links to more cemeteries as we do more research. Holy Trinity Anglican Church and Cemetery, North Sannich, B.C. Naval and Veterans Cemetery, Esquimalt, B.C. St. Luke’s Anglican Church and Cemetery, Saanich, B.C. 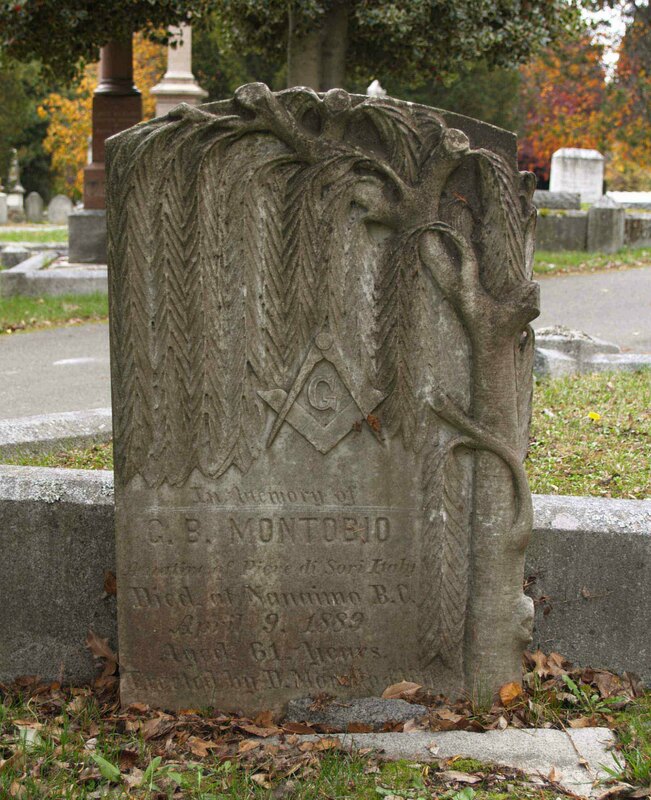 The grave stone of George B. Montobio (died 1889, aged 61) in Ross Bay Cemetery. This grave stone features the Square & Compasses and an Acacia tree. It is one of the best pieces of Masonic grave monument art in Ross Bay Cemetery. We will be adding more cemeteries in due time.